This post originally appeared on Houstini.com on March 10, 2012. 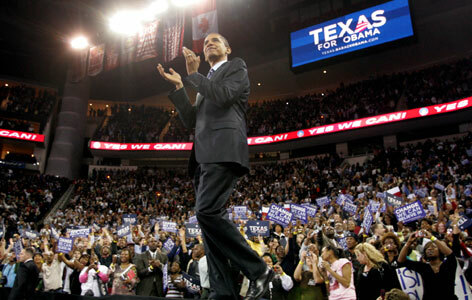 Metro Weekly reports that in 2008, then-Sen. Barack Obama told the Houston GLBT Political Caucus that as president he would support requiring companies doing business with the government to implement non-discrimination policies that would protect LGBT people. Obama, as a candidate seeking the Democratic nomination to run for president in 2008, was asked by the Houston GLBT Political Caucus if he would support a "formal written policy of non-discrimination that includes sexual orientation and gender identity or expression ... for all Federal contractors." Obama's response – according to the survey, a copy of which was provided exclusively to Metro Weekly on condition of anonymity – was one word: "Yes." Jenifer Rene Pool, who served as the Caucus president in 2008, confirms that Obama did answer the questionnaire as reported, adding that during the Caucus' interview she directly asked the candidate if as president he would issue an executive order instituting such a policy. "I was the primary interviewer and I reiterated the question and heard him say that he supported and would make that order," said Pool. Pool adds that she feels that as president Obama has done a lot to improve the lives of LGBT Americans. "Having looked at what he has done for GLBT equality in other areas I will not complain too hard that he hasn't done that yet," said Pool. "However I think it's important that we continue to communicate the need for this policy." GetEqual, a national grassroots organization with a mission " to empower the... (LGBTQ) community and our allies to take bold action to demand full legal and social equality" has started a petition encouraging President Obama to issue that promised order. "When Obama was running and when he was elected he told us 'I need you to hold my feet to the fire,'" says GetEqual state coordinator Michael Diviesti. "This petition is one of the ways in which we empower him to do the things he promised."